Master Gardener Mary McCurdy guides students from Dudley Elementary School through Victoria Educational Gardens in May. McCurdy explains how plants, like kale, become food from growing in the garden. Next to the vegetable garden is the new pavilion used for educational activities, food and restroom breaks. 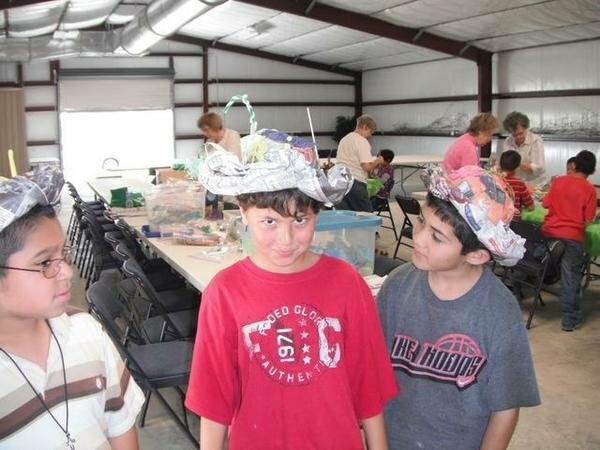 Dudley Elementary School students, from left, Justin Vega, Jonathan Loya and Roman Acosta show off their decorated paper hats with symbols of needs of a plant at Victoria Educational Gardens. The newest feature at Victoria Educational Gardens is the pavilion adjacent to the vegetable garden and near the 4-H Activity Center. It is fully equipped with air-conditioning, a make-ready breakroom/kitchen and restrooms. 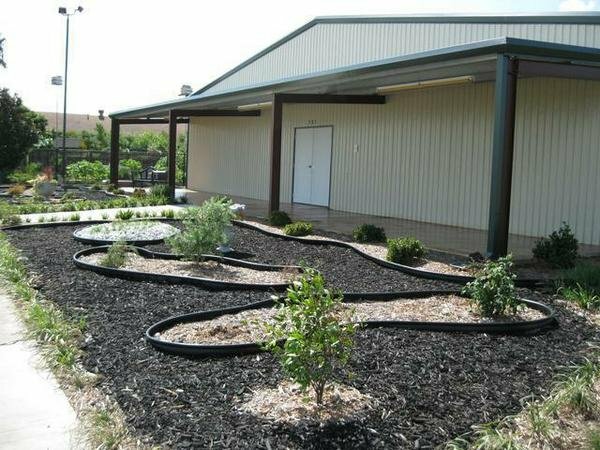 It is used for VEG tours, Master Gardener trainings and plant sales. Public usage of VEG for special events may be arranged for a fee and includes the pavilion, or the two may be reserved separately. Each year, hundreds of children from area schools come to the Master Gardener Victoria Educational Gardens to enjoy and learn about nature. With school about to start, gardens will make a wonderful fall destination. Children learn how butterflies complete their life cycle from a tiny egg, which may be laid under a leaf, to a caterpillar, then to a chrysalis, and then, several weeks later, emerge as a beautiful butterfly. They watch as wings unfold, dry and flit away into the air with beautiful colors to be enjoyed in the garden. Some of the butterflies may be in the Hidden Garden's screened butterfly house, where they actually go through their life cycle. The children learn about the host and nectar plants that grow in the screened butterfly house, which could include rue, butterfly weed, dill, fennel and pentas. They also learn about the passion vine, which is a host plant for the Gulf fritillary. The children are amazed to see how the black swallowtail caterpillars will eat almost all of the dill plants growing in the corner of the garden. One of the two fish ponds with goldfish and water lilies greets children as they enter the gardens through the decorative iron gates. They are fascinated by the fish swimming in this one, but when they go to the water garden filled with large koi fish and with water spilling over rocks, you see amazing looks on their faces as the colorful koi skim the water's surface scooping up the fish food thrown into the pond by one of the volunteers. Our Master Gardeners may dig a carrot or a potato out of the vegetable garden and explain how each grows in the soil. They explain that these are the vegetables that are eaten as raw or cooked carrots or that the potatoes are peeled and made into french fries. There are green beans, cucumbers, artichokes and other vegetables growing in the vegetable garden for them to enjoy seeing. Children learn that the vegetables are grown in gardens or fields before being taken to the food store to be sold. They love to see the apples, pears and nectarines growing on the trees by the side of our new pavilion. The bird house is always enjoyed when the children march along flapping their arms as they imagine they are a bird and go through the front entrance hole of the life-size bird house. Once inside, one of our Master Gardeners may read a story about vegetable or flower gardens, birds, bugs, grasshoppers or butterflies. Near the vegetable garden is the greenhouse where most of the plants for our bi-annual fundraiser plant sales are grown. Volunteers may explain how the various plants are propagated. Note: The date for the fall plant sale is Sept. 11. Master Gardeners in the sensory area explain our five senses (sight, sound, touch, smell and taste) using plants. As visitors stand on the large sun patio they may taste and smell the fragrant mint that is growing nearby. Children are then usually ushered around the alphabet circle to learn about the different plants representing the letters of the alphabet. An alligator plant represents the letter "A," a batface cuphea with the little bat face-like flowers represents the letter "B," and so on around the circle. The volunteer talks to the children about the different colors of the rainbow represented by the different colors of the plants located there. While the gardens are typical to this area, there is one specifically all about Texas. The children touring move on to the Texas native area with the Texas shaped patio and talk about the state flag, state bird, state flower, state tree and other native plants. Last fall, the pavilion at the garden was constructed, and it is now used rain or shine for gardens tour youth-educational activities. Children plant seeds in earth-friendly paper cups made by Master Gardener volunteers. Each may take their own planted seed home to transplant into home gardens, and watch it grow into a tall sunflower (or whatever). Another activity enjoyed by the children is making paper hats from newspaper to learn the needs of a plant. After each child's hat is completed, they decorate the hat with symbols of the needs of a PLANT: P - a place (pot or soil) to grow, L - light, A - air, N - nutrition and T - thirsty (for water). Gardens tours are not only enjoyed by children, but adults, as well, as they walk through the 19 mini-gardens and admire the daylilies, the fragrant rose-covered arbor, two gazebos and different kinds of plants in each garden. As the wind blows the chimes and music floats through the air, you may also hear conversations about the veteran memorial garden. Bricks purchased by family and friends with names of men and women who have given service for our country are laid in that area. The huge patio on the east side of the refurbished officer's club is filled with special potted plants, which are enjoyed by all who tour the gardens. In all, 2,200 visitors have toured the gardens since the first of last year. There is something for everyone to enjoy and learn from our gardens year around. The gardens are open from dawn to dusk. 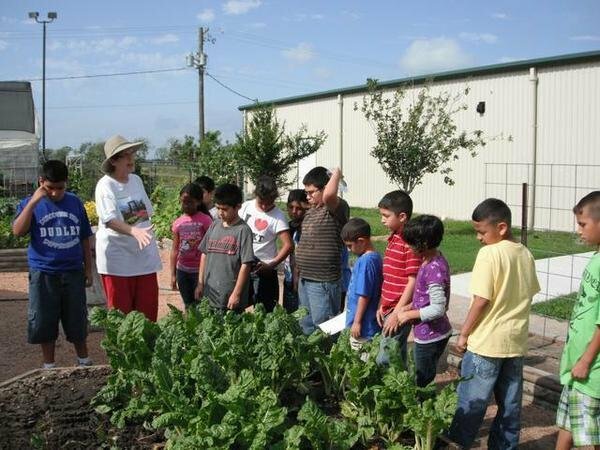 The Gardeners' Dirt is written by members of the Victoria County Master Gardener Association, an educational outreach of Texas AgriLife Extension - Victoria County. Mail your questions in care of the Advocate, P.O. Box 1518, Victoria, TX 77901; or vcmga@vicad.com, or comment on this column at www.VictoriaAdvocate.com.